Herefords took Denver by storm in the Yards and on the Hill at the National Western Stock Show Jan. 16-19 in Denver. A total of 806 Herefords were exhibited throughout the four-day event. There were 363 head in the open show, 195 in the junior show, 44 pens of bulls, 22 heifer pens and five carloads. Hereford activities got underway in the Stadium Arena on the Hill with the junior show on Wednesday, Jan. 16, judged by Todd Herman, Lima, Ohio. Thursday, Jan. 17, Charlie Boyd Jr., Mays Lick, Ky., along with associate judge Blake Boyd, Mays Lick, evaluated the bull show. Friday, Jan. 18, was the pen and carload show judged by John McCurry, Burrton, Kan.; Cody Sankey, Economy, Ind. ; and Brent Meeks, Taylor, Neb. The Mile High Night National Hereford Sale completed the day, where 34 lots grossed $830,450 and averaged $24,425. The Hereford Youth Foundation of America’s Lot 1 Foundation Female raised $120,000 for Hereford youth. The National Hereford Female Show took place Saturday, Jan. 19, judged by Charlie Boyd Jr. and associate judge Blake Boyd. Supreme champion Hereford and grand champion horned bull, BR Belle Air 6011 first won the horned senior bull division. Owned by Barber Ranch, Channing, Texas; Colyer Herefords, Bruneau, Idaho; Bill King, Moriarty, N.M.; and Rylee Barber, Channing, Texas, Belle Air is a February 3, 2016, son of BAR S LHF 028 240. This victory makes Belle Air the first bull in the history of the NWSS to win supreme Hereford twice, first winning as a bull calf in 2017. Not only was Belle Air able to pull off this feat, his son stood next to him as reserve champion horned bull. The reserve grand champion horned bull and junior bull calf champion titles went to EXR Bankroll 8130 ET, owned by Express Ranches, Yukon, Okla. He is a Jan. 18, 2018, son of BR Belle Air 6011. Winning grand champion polled bull and yearling champion bull was Hoffman Herefords, Thedford, Neb. ; Express Ranches, Yukon, Okla.; Williams Hilltop Farms, Rushford, Minn.; and Ward Ranch, Edmond, Okla., with H Deberard 7454 ET. He is a March 14, 2017, son of UPS Sensation 2296 ET. Reserve grand champion polled bull and champion spring bull calf honors went to Brady Robert Jensen, Courtland, Kan., with KJ BJ Landmark 210F ET. He is a March 9, 2018, son of KJ BJ 319X Laramie 619D ET. Saturday in the female show, grand champion polled female and champion junior yearling female honors went to Ned & Jan Ward, Sheridan, Wy. ; and Pablo Herrera, Sheridan, Wy., with NJW 36A 10W Turquoise 22E ET. She is a Jan. 29, 2017, daughter of LJR 023R Whitmore 10W. Bentley London, Collinsville, Texas, claimed the reserve grand champion polled female and champion spring yearling female title with SC Nova 04E ET. She is a April, 2, 2017, daughter of AH JDH Cracker Jack 26U ET. 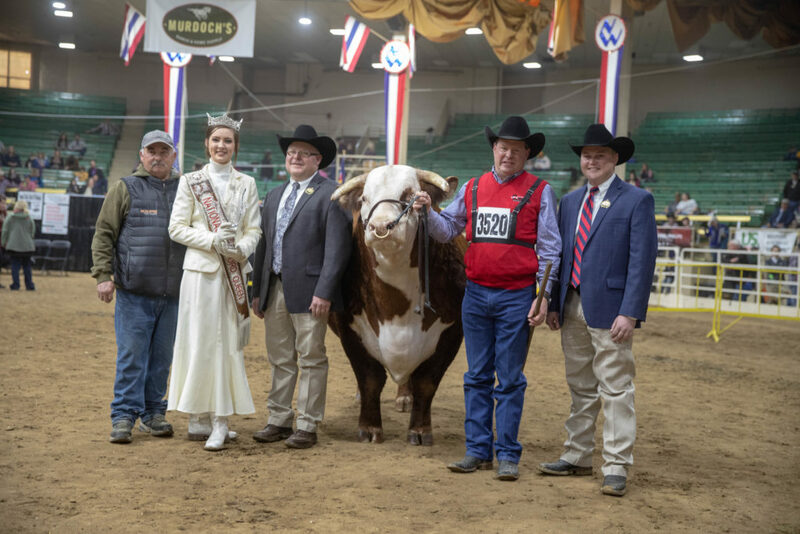 Moore Cattle Co., Madill, Okla., exhibited the grand champion horned female, BK Enchanted Points 7083E ET. The Sept. 14, 2017, daughter of CRR 719 Catapult 109 first claimed champion senior heifer calf. The Porter Family Partnership, Greenfield, Tenn., won the reserve grand champion horned female and the champion summer yearling female banner with LILLIES Spice. She is a July 3, 2017, daughter of H/TSR/CHEZ/Full Throttle ET. Hoffman Ranch, Thedford, Neb., was named polled premier exhibitor and polled premier breeder. Buck Cattle Co., Madill, Okla., was named horned premier breeder and GKB Cattle Co., Gary and Kathy Buchholz, Waxahachie, Texas, was named horned premier breeder.